Familiar all over the world, chili comes from the Americas, and its strongly pungent flavour spices up countless dishes. The constituents responsible for the hot, sometimes fiercely hot, impact of chili when eaten are also those most involved in its many medicinal applications. Cayenne is used for strengthening the heart muscles and for increasing circulation. In emergency situations, such as heart failures, cayenne can be administered to stimulate the heart muscle, restore active circulation and normalise blood pressure. 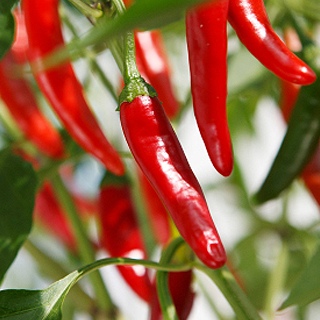 Cayenne stimulates gastric secretions and assists in digestion. The herb is commonly employed for treating cold extremities and the common cold. The herb may be taken as a part of a daily diet, to ward off disease in general and specifically to act as a prophylactic against cancer. It is commonly added to other herbs to strengthen and stimulate their action within the body. Capsaicin, the compound that gives peppers their heat, may also help fight obesity by decreasing calorie intake, shrinking fat tissue, and lowering blood fat levels, as well as fight fat buildup by triggering beneficial protein changes in the body. When black pepper is combined with capsaicin, black pepper has been found to burn as many calories as taking a 20-minute walk since it blocks the formation of new fat cells. Heat 1oz (30g) of the powder, or 3–4 chopped fresh chiles, in 1 pint (600ml) of sunflower oil in a bowl over a saucepan of simmering water (bainmarie) for 2 hours. Use as a massage for rheumatism, lumbago, arthritis, and so on, or to relieve pain from shingles. Take 20 drops (1ml) in a cup of warm water as a circulatory stimulant for cold hands and feet. Basic tea of the dried crushed or ground peppers taken with caution, 1/2 teaspoon (1/2 g) per 1 cup (240 ml) of hot water. Use 5–10 drops (1/4–1/2ml) of tincture or a pinch (1/8 tsp) of cayenne powder to half a tumbler of warm water for sore throats or laryngitis. The fresh or dried peppers are covered with vinegar in a macerating jar, left overnight, then blended, macerated for a week, and expressed. Add salt to taste. This makes a thin hot sauce that may be used with food freely according to tolerance. Take 1 tablespoon (15 ml) of cayenne pepper and infuse it in 1/2 cup (118 ml) of olive or grape seed oil by using a double burner. Heat the oil mixture until warm and turn of the heat. Leave it to stand warmly for around 20 minutes, then turn on the heat for a few minutes again, and turn off the heat once warm. Leave to stand for another 20 minutes. Repeat this process for at least one hour to 24 hours. Once the spice has been infused into the oil, strain the mixture in a cheesecloth and reserve the liquid, adding a few drops of Vitamin E oil. Working quickly, heat 14 grams of beeswax until melted and mix well with the infused oil. Pour the liquid into containers and leave to set into a solid salve. Once set, use the salve on aches and pains, from sore muscles and joints to nerve pain. It is normal for there to be somewhat of a burning sensation when first applied. It should be applied externally only and used within 6 months for best results. Apply daily to decrease chronic pain. Cayenne does sting when it comes in contact with your eyes - be sure to wash your hands thoroughly after use. Sow 2–3 seeds in each 3in (7.5cm) pot using good-quality compost. Plant when the soil temperature reaches 59F (15C) or, in temperate regions, pot into large containers and keep in a greenhouse. Gather the fruits when ripe in summer and dry immediately in the shade.